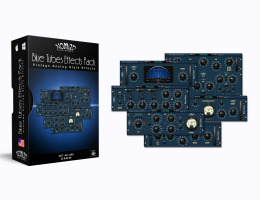 The Blue Effects Pack is a collection of 6 plug-ins processors designed to improve the quality of digital sound recordings. This bundle recreates the warm sound qualities of classic analog hardware. The sound quality of Blue Effects pack is nothing short of amazing. Yet all 6 plug-ins provide a simple and functional vintage-style interface, as well as low CPU consumption for lightening-fast processing. The BT Dual-Analog Chorus CH2S creates various types of classic modulation effects, such as Leslie, Chorus, and Auto-pan. In addition, this effect provides the ultimate in control over LFO's and panning, including waveform selection. Whether you need subtle enhancement or aggressive effects on a track, the CH2S has the power you need. The BT Tempo Delays DL3D is a tempo-driven delay effect with a classic analog sound. No more trial-and-error in setting tempo-based delay times. Simply sync the tempo of the song, and select the note value corresponding to the desired delay time. This delay provides three separate channels. Using the Pan controls, you can pan all three delay channels to the center, or spread the channels out across the stereo field (left, center, right). Gain controls set the levels for each channel individually. The BT Analog Valve Driver ADR2S delivers that authentic saturation effect found in many vintage tube amplifiers. Not only does this model provide a tube-like Overdrive effect, but also High Pass and Low Pass filters and a Noise Gate to enable greater control of your overdriven sound. If your clean tracks call for a powerful and warm overdrive, your answer is the ADR2S. The BT Analog Phaser APH2S is designed with all of the characteristics of a vintage analog phaser. The selectable 4-, 6-, 8- or 12-stage resonant analog filters enable this phaser to create various modulation effects. Various controls on the APH2S, such as Speed, Depth, Resonance, and Stage, all contribute to a wide range of phasing effects. Additionally, the Width control provides an adjustable stereo field and a Color control. The BT Vintage Oilcan Echo TLE2S delivers the classic analog sound of a tape less oilcan echo/delay. This model adds Color to your music by providing various echo/delay styles from specific time periods, namely 1964, 1977, 1989, and 1995. These styles, along with the other various controls on the TLE2S, give you a wide range of time-based effects to add to your recordings.